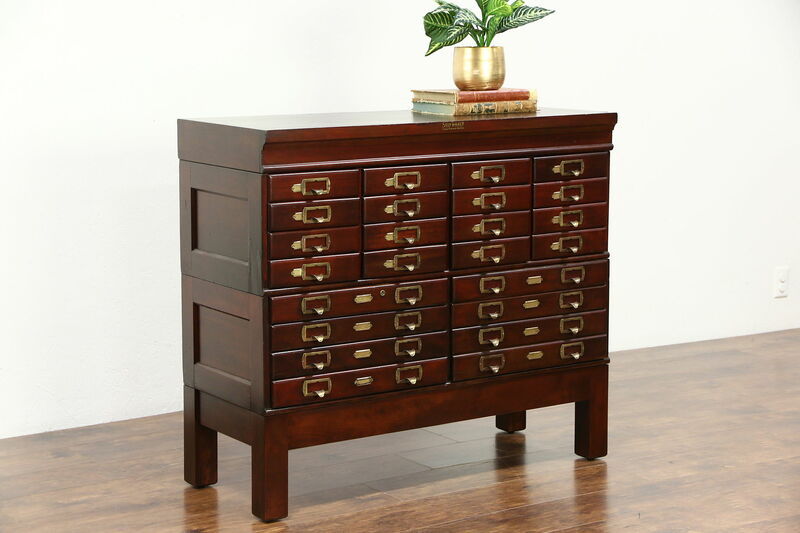 A stacking desktop file cabinet from about 1910 has 24 drawers of two sizes, signed "Shaw Walker of Muskegon, Chicago and New York." Solid birch, the renewed finish is in excellent condition, preserving a few mars for antique character. Brass pulls and label holders are original on this American made office or library furniture. The separate base module is rebuilt. Large drawer interior measurements are 18 1/2" wide, 14 1/2" deep and 2" tall, small drawers are 8" wide. Overall dimensions are 42" wide, 17" deep and 37" tall.